Many organizations try to boost employee productivity by using traditional analytic approaches which focus on strategic planning, goal setting and process efficiency measures. These methods reflect the belief that better systems, planning and processes lead to better employee performance. Other organizations emphasize improving employee benefits, perks, compensation, and schedules as a means to increase productivity. This approach reflects the belief that better rewards lead to higher levels of employee motivation. Both of these strategies for improving employee performance make perfect sense. However, both approaches are inevitably doomed to fail in organizations that do not have the requisite management talent in place to maintain high levels of employee engagement, morale, motivation and clarity. Even the best planning processes and the highest reward and benefit levels can not overcome the detrimental effects of poor managers on employee productivity. The Gallup report is backed up by 40 years of research and analysis measuring the levels of engagement and productivity of 27 million employees. That leaves a whopping 70% without the talent to manage. This 70% group often deals with workplace issues by using the morale destroying techniques of manipulation, office politics and micromanagement. That’s why this 70% group are most responsible for the problem of disengaged employees. That’s why organizational success depends upon diligently identifying, training and coaching those employees who have the uncommon skill sets to be great managers. 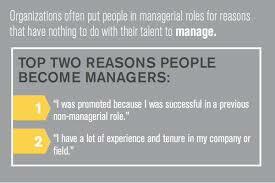 So what are the skills a manager needs to drive improvements in individual and organizational performance? 1.) They need to know how to motivate employees. 2.) They need to know how create a culture of accountability. 3.) They need to be relentless in overcoming obstacles. 4.) They need to build trusting relationships. 5.) They need to make fair and unbiased decisions for the good of their team and the organization. These skills are inextricably linked, mutually reinforcing and dependent upon each other. In order to use the power of positive reinforcement to motivate employees, a manager needs to have a trusting relationship with employees. Cultivating a trusting relationship with employees depends on being seen as a straight shooter who doesn’t play favorites. Demonstrating a willingness to recognize and remove external obstacles to team success, creates a “can do” mentality and fosters a culture of individual responsibility and accountability. A culture of accountability motivates employees and builds trust. These interconnected management attributes create a virtuous cycle of individual and organizational success and yet, according to this latest Gallup report, the great majority of managers don’t even come close to possessing them. Think about that the next time a technically competent individual contributor, with poor people skills, is considered for a management position in your company. I would be interested in finding supports in dealing with management issues and work related issues. Thanks for your comment. I’d be happy to help you find supports. Please contact me directly at msagor@compeap.com if you’d like to set up some time to discuss.